Why is it so hard these days to tell fact from fiction? Who can be trusted to tell us what’s really going on? Can the New York Times and Washington Post still be believed? And what about money? Can we still trust the dollar, the euro, the pound sterling? What supports national currencies, anyway? Is this Bitcoin thing real or fake money, and should I buy some? Here’s a compelling presentation by Andreas Antonopoulos, that addresses all of these questions. Antonopoulos is a technologist and entrepreneur and probably the most knowledgeable and insightful expert on bitcoin, blockchain technology and the profound changes that lie just ahead. Bitcoin is a virtual commodity that is created by running some obscure algorithm. The people who get rewarded are the “miners” who burn up enormous amounts of computer time and electricity to create Bitcoin. That makes it akin to mining gold or silver—not a very useful pursuit, and like any commodity, people will prefer to use it as a savings medium or hedge against inflation rather than circulating it as a currency. Bitcoin is NOT the answer to the money problem. The important thing about blockchain technology is what it can do, what functions it can perform. You hear a lot about “smart contracts” and a secure trail of transactions. It seems to be something that is needed when using digital forms of contracts and transactions conducted over the internet, but provides no new functions compared to what has always been done with paper trails and records, but maybe I’m missing something. The term “crypto-currency” is ill defined and there is much confusion about the characteristics of such a currency and what it can achieve. The fundamental principles of reciprocal exchange still hold. The substance of a currency or payment medium is CREDIT. Claims still need to be authenticated and promises need to be guaranteed. TO ENABLE ANYONE, ANYWHERE TO USE WHAT THEY HAVE TO PAY FOR WHAT THEY WANT. What they might have is skills, abilities, products, services and credit that is advanced by a circle of people who know them and trust that they are ready, willing, and able to deliver value on demand in the near term. I have argued that the truly disruptive technology of exchange is a global network of small credit-clearing circles that provide “a means of payment that is locally based and controlled yet globally useful. 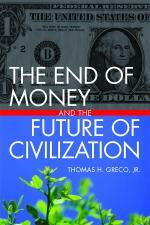 It makes money and banks, as we’ve known them, obsolete. My talk in Malaysia in October at the International Forum on Inclusive Wealth (http://ifiw.my/) will be on that topic and will build upon the framework that I laid out in my book chapter, https://beyondmoney.net/excerpts/chapter-17-complete-web-based-trading-platform/. –t.h.g.